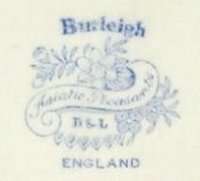 In 1867 Samuel Alcock & Co vacated the Hill Pottery and the Burgess & Leigh took it over together with many of its patterns and the beehive trade mark device, but not until 1877 did the partnership move to become Burgess & Leigh for trading purposes possibly freed from earlier contractual or financial constraints. The firm flourished and continued to expand and moving to the Middleport works in 1889 which were purpose built for them. During the first War the company turned to Toilet and Sanitory wares which they had largely discarded by 1919 when they floated as a Ltd. company. Between the Wars brought the launch of the Burleigh trademark in 1930 and the company were associated with contemporary Art Deco designs employing some famous designers. The company survived the post war domestic decline in pottery production independently avoiding being swallowed by larger competitors into the 1990s when the company went into gradual decline until they finally followed so many others into receivership in 1999. "Asiatic Pheasants" pattern seems to have been a cornerstone of the company's business with marks representing production from the earliest days around 1877 right through the 1930's into the latter part of the C20th. After receivership the companies assets were bought up and a new company formed. The new owners styled themselves as Burgess, Dorling and Leigh Ltd and have revived the business largely by revisiting Victorian patterns and styles including "Asiatic Pheasants", using the traditional methods of production. 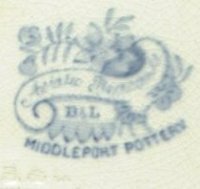 Copperplates for transfer production do wear out but the new owners remain faithful to the version the Middleport pottery were producing from 1889 onwards.